As promised we tried my new game, ‘Burgle Bros’ (by Tim Fowers). The game is a co-op, themed around a Hollywood-style heist (think Ocean’s Eleven, or Mission Impossible). Essentially, your team of burglars work their way around the target building, finding and cracking safes, before exiting with the loot via the roof. A variety of rooms are represented by face-down tiles in a 4x4 grid with some intervening walls. There is a patrolling guard on each floor, who you try to avoid, and whose movement is a clever mix of predicable and random elements. The rooms themselves contain a mix of alarms (which you may wish to avoid or trigger) and ‘traps’, and the key tiles you need to search for are the safe and the stairs up to the next level. Elaine and I first tried a 2-player ‘beginner’ game and succeeded in completing the mission. I felt we were very lucky in the location of the safes and stairs, which were closely placed on both floors, and this made the mission much easier. I suspected that an increased separation of these tiles would up the difficulty, and increasing the player count would also up the difficulty. So when Val and Chris came round we replayed the ‘beginner’ game. Another success but much closer; 2 of the team had no ‘lives’ left when we escaped! We all enjoyed this challenging game, it could have gone either way, and we agreed that the addition of a third floor (i.e. the standard version) would make the game very difficult indeed. 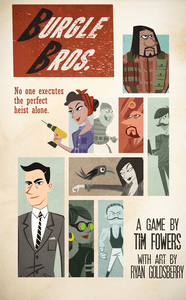 So, I am very pleased to have received ‘Burgle Bros’ (thanks Gill et al. for an inspired prezzie!) and I look forward to many more outings. 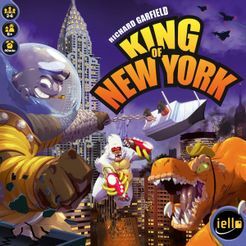 Next we played a game of ‘King of New York’; I am keen to play a few more ‘old’ games rather than just trying new purchases. I had forgotten how good a game this is! The simple ‘yatzee’ dice mechanism works so well, and the strong ‘take that’ style of play suits the light-hearted theme. I was the first player eliminated; my monster was set up for ‘celebrity’ and I just could not roll stars! Next down was Elaine, who stayed too long in Manhatten, and Val quickly emerged as the winner by taking down Chris in a devastating attack (5 claws!). This a game that deserves more plays; it is quick enough to make the player elimination aspect to work well because you know you won’t be kicking your heels for long. I personally like the additions/options in the ‘New York’ version, but I would still enjoy playing the basic ‘Tokyo’ game. We finished the session with another ‘old’ game that had not had an outing recently, ‘Five Tribes’. The mancala-style mechanism and the range of options available, make this game a real brain-burner. Analysis paralysis (AP) can be an issue, but we are lucky that none of us take too long and can make a decision without worrying about whether it was the most optimal. If AP was a problem, then I would introduce a timer element (e.g. set at 60 seconds) to ensure the game progresses. Elaine does not particularly like the turn order bidding aspect and I tend to agree, especially when playing the 2-player version. 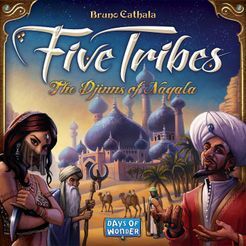 Interestingly I do have the expansion with a 6th tribe and additional tiles, but I have never felt the need to try it because the base game works fine and requires no added complexity. I won the game (beating Val by a single point! ), and the scores were fairly close between all players.